This route offers us an unforgettable journey through beaches, museums, interpretation centers, bays, national parks and more. During the route of the Spondylus Route, we will discover the diverse elements that make up the culture of our country, especially the Ecuadorian coast. Your biggest challenge will be not to fall in love with all our beautiful beaches. Come to the Spondylus Route and capture unforgettable moments, come to Ecuador. 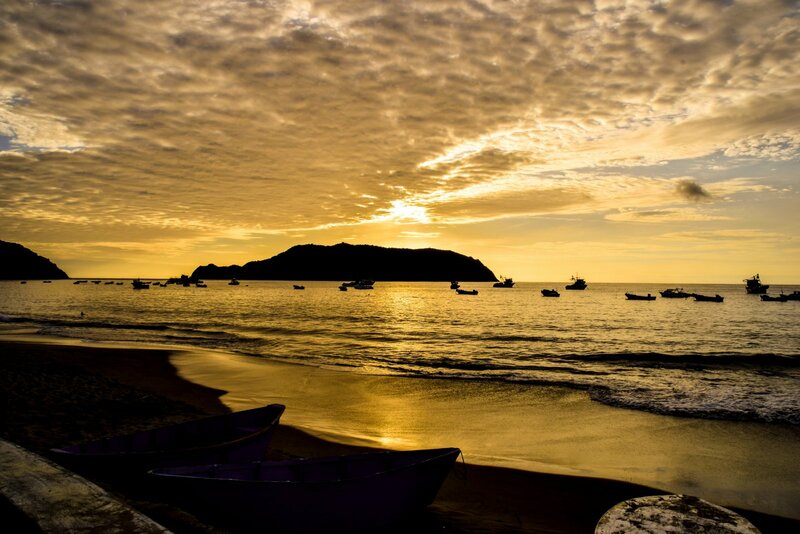 In addition-to the Gulf of Guayaquil, the Machalilla National Park and the Pacific coastal zone. The beautiful beaches that surround the Ecuadorian coastal area will start the Spondylus Route, where you can live unforgettable moments. You will be able to know different elements that are part of the culture and tradition of Ecuador, as well as tourist areas of great value. The Spondylus Route, includes a route along the Ecuadorian Coast that involves many magical places along its route, this route has been named after the Spondylus shell, which has an important value in the Valdivia culture in recent years. Spondylus shell was worth more than gold. It was considered a food of the gods, was admired and coveted by pre-Hispanic civilizations from the Late Valdivia period until the arrival of the Spanish conquerors in the sixteenth century. It is believed that the Incas came to the territory of present-day Ecuador behind this precious mollusk. It served as a transaction currency, personal adornment, to make anthropomorphic statuettes, zoomorphic sculptures, funerary offerings, as part of religious rituals and food of the gods. Magic-religious beliefs in Mother Nature governed the daily life of pre-Columbian cultures, to the point that they believed that owning a spondylus shell was synonymous with abundance, good omen, rain, was linked to fertility. It is a road that starts from the Province of Esmeraldas, heading south, passing through several cities and Ecuadorian provinces along the Pacific coast. The Spondylus Route reaches the border with our neighboring country Peru. Museums: throughout the tour you will have the opportunity to admire and learn about the culture and tradition of various ancestral cultures that inhabited these places, these museums transmit knowledge to locals and foreigners to keep ancestral knowledge alive. Archaeological Museum of Manta: exhibits pieces of Las Vegas, Manteño, Valdivia, La Tolita cultures among others. Museum of the Agua Blanca Community. Some local museums, where you can admire archaeological remains up close and get to know the following cultures, such as in Sumpa and Valdivia, in Santa Elena, and Chirije, Cerro Jaboncillo and Agua Blanca, in Manabí. Along the Route of the Spondylus, in addition to knowing about the pre-Columbian cultures, you will be able to know Montecristi where its main tourist attraction is the toquilla that is recognized as an intangible cultural heritage. Machalilla National Park, where the Isla de la Plata is located. Beaches of Olón, of 3 kilometers, and whose main attractiveness is the sanctuary of the Virgin, located in an inlet, from where the landscapes with impressive. The beach of Montañita will also be attractive, as it is a favorite destination for surfers. The Ruta del Spondylus tour is a tour through some of Ecuador's most attractive landscapes. An itinerary of multisensings and experiences in the different tourism options that go from the sun and the beach, to the cultural-archaeological tourism, handicrafts, gastronomy, ecotourism and nature tourism, sports and adventure, agrotourism, etc. The Spondylus Route runs through the marine paradises of Ecuador, from the cloud forests northwest of Quito to Guayaquil along the coasts of Esmeraldas, Manabí and Guayas. The route of the Sun is part of the Spondylus route. The climate varies along the Ecuadorian coast. As a general rule we have that in Guayaquil and to the south, from January to May is the warm and rainy season, while the rest of the year is drier and fresher. The recommended months to visit this route are from June to September, since in these dates are the mating period of humpback whales, the main drawback of this time is the high influx of tourists and the increase in the prices of tourist services offered.